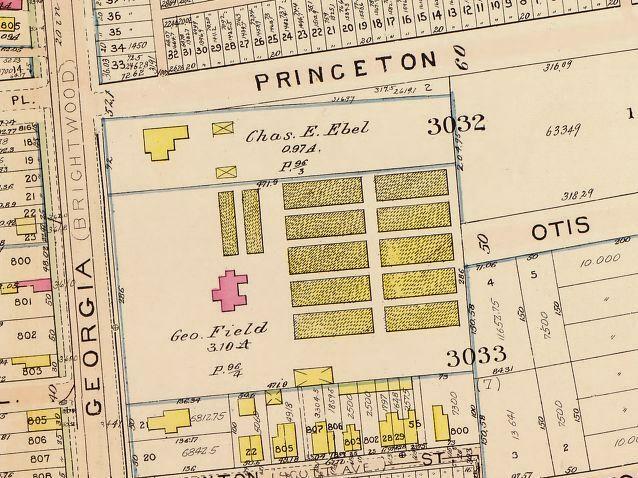 Georgia Avenue History: Lost Country Houses | Park View, D.C. Recently I found a great article from the Washington Star that provides a snapshot of the kind of estates that one populated Georgia Avenue around Rock Creek Church Road before they were razed to make way for the growing suburbs. 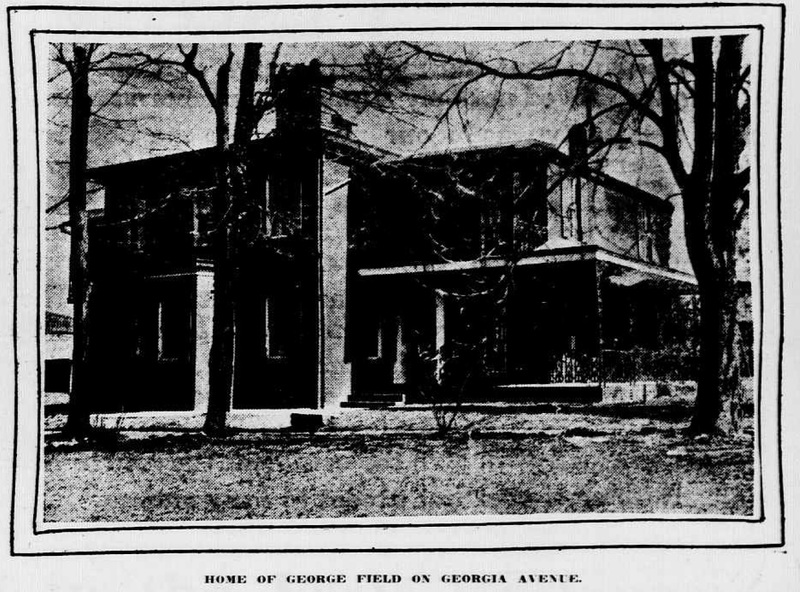 Two properties are featured, one being the house of George Field which was located on the east side of Georgia at Otis. In fact, the Field house was literally on Otis, and razed so that the street could be cut in. The article was published on March 19, 1916, and though unknown to the author, is interesting in that the Field property would not remain a stately country home much longer. Beginning in 1917, Lewis Breuninger would begin subdividing the property into the street we see today. I’ve also noted before that the home of George Field was known for its greenhouses and has a connection with the development of the American Beauty Rose. An old and well maintained red brick house on the east side of 7th street just north of Park road has often attracted the attention of the Ramble, and no doubt many thousands of other Washingtonians hae given this picturesque and old-fashioned place a glance and a thought. That house stood there when the great highway which passes before it was called the 7th street road or the 7th street pike, a name which was discarded in favor ot “Brightwood avenue,” and which name gave way to “Georgia avenue.” The house is old, but the Rambler, in a spirit both of compliment and of truth, must say that it still looks young. The Rambler will not say of this house that “it does no look its age.” This is often said of a man, and perhaps sometimes of a woman, but the Rambler feels that though this observaiton may be prompted by the kindliest sentiment, yet it is a compliment that has whiin it a bitter tang. The Rambler does not know to what age this house has attained. Its walls, its rafters and its roof are sound, and, as it is often said that a man is no older than his arteries, it might just as fairly be said of a house that it is no older than its walls and its roof. It may be that this house, like so many old men, is proud of its age, but the Rambler believes that this particular house will not asssume a resentful attitude toward him for writing that it is still a young house and that it will preserve its youth for many years to come. It sits far back from the street, as though it would preserve its air of exclusiveness even in this age of publicity and notoriety. This old house seems to protest against the habit which so many modern houses have fallen into, of building themselves flush with the sidewalk and perching themselves where any man may rub elbows against them or strike matches on their front. This old house, if it could get its own sentiments and convictions into the newspapers, wold probably denounce as a vulgar fashion the passion which new houses have for getting as close to the curbstone as the building regulations and inspectors will permit. This house belongs to the period when every well-mannered, dignified and properly conducted house insisted on having its own garden and rejoiced in a name instead of a number. The Rambler is violating no confidence when he assures his readers that this old house, comfortably seated in its own grounds, feels pity, with just a trifle of disdain, for those misguided houses which stand up in a row, all so near alike that their sole distinguishing mark is a number on their transom or the door. The house has a central building flanked on each side with a wing. It has a plenitude of porches, and the porches have width, length and iron railings. Above the roof rises a lookout or a little observation tower. Many trees grow around the house. Its lot is of about the size of a city square and the northwest corner is covered with a rose garden. This garden, with its wealth of bloom and color, has given pleasure to countless wayfarers along the old 7th street road. At the north side of the house and at its rear are glasshouses, in which live flowers of rarity and beauty. The Rambler was walking along Georgia avenue last Sunday and paused opposite this attractive old house. He wanted to go in and speak to it, but there were restraining considerations. It requires a certain amount of boldness to walk up to a city house, ring its doorbell and ask it the story of its life. There is always the haunting feeling that the city house may consider the Rambler an intruder. Well, when the Rambler saw this dignified old red brick house, with its wings and its cupola and its porches, all settled back in its big garden he felt that it required nerve to interrupt such an old house in its Sabbath meditations. But then there were the hundreds of rosebushes in the garden and the greenhouses at the side and rear, and the Rambler felt that a house so fond of flowers much be a good and gentle old house, so nerving himself for the encounter, he walked down the footpath between the broad lawns and rang the doorbell. A young man with white hair came to the door and the Rambler asked when the house was built, who its owner was and if it would object to having its picture taken. “Come in,” said the man. The ice was broken, and the Rambler and George Field sank into two easy chairs in the handsome library of the fine old house. Mr. Field and his wife have lived in the house since 1889. At that time it was owned by two members of Congress from Kansas who had bought the property from the Stickney family, and it came to the Stickney family through marriage with the Lewis family, the old house having been for years the home of that Mr. Lewis who was president of the Seventh Street Turnpike Company. The Rambler did not have the honor of an acquaintance with this family, but will endeavor to obtain more information concerning this old Washington family than he now has. The Rambler remembers that before the civil war there were living along the 7th street road between the Boundary (Florida Ave.) and Piney Branch the following: J. Johnson, Mrs. Beckert, W. Belt, E. Lundsley, Charles G. Page, W.G.W. White, W.M. Cammack, J.B. Haw, J. Holmead, J.E. Wineberger, J. Homer, Benjamin Summy, W. Little, A. Ray and John Saul. Off the 7th street road beyond the Rock Creek Church road were the farms of O.B. Taylor and T. Mosher, and off the 7th street road in the Piney branch neighborhood were the farms of Dr. Noble W. Blagden, Mrs. C. Saunders, William Morrison and Mrs. S.A. Greeves. About a year ago the Rambler jotted down some valuable memoranda which were given him concerning this territory by William J. Frizzell, but he lost the notes. The Rambler is reminded of some interesting matter relating to the gentleman who now lives in the old brick house in the big garden by the side of Georgia Avenue west of Park road. George Field and his brother, Thomas Field, were propagators, or developers, or whatever the right word may be, of that rose which is no famous as “the American beauty.” George Bancroft, the historian and diplomatist, and John Brady, a florist, still living in Washington and who is also one of the Rambler’s friends, were actors in the romance of the great American rose which the whole world now knows as “the American beauty.” A very bitter controversy arose as to the origin of this rose when it became rich and famous, but the Rambler is not a party to this war of the rose and his chief interest in it is that it was born in Washington and discovered and developed to its present state of beauty by Washington men. There is glory enough for all those men who were concerned in discovering and developing the American beauty. As a great many persons know, George Bancroft was a lover of flowers and at his home at Newport had one of the great rosariums, or rosari, of the United States. He had brought together there hundreds of the fine varieties of roses grown in France, Germany, Belgium and England. Part of his collection he maintained in the grounds appurtenant to his Washington home on H street At this point it is proper to give a few facts relating to Mr. Bancroft. He was born near Worcester, Mass., in 1800. He was educated, or at least he received his youthful schooling, at Harvard and in Germany. In 1832 he published a translation of Heeren’s “Politics of Ancient Greece” and a small volume of poems, and at that early period in his life was contemplating writing a history of the United States and was actually collecting materials. Three volumes of that history were published between 1834 and 1840. He was appointed Secretary of the Navy in 1845, but in the following year he was transferred to England as ambassador from the United States and remained in that distinguished office until 1849, when he returned to New York and began to prepare for the press the fourth and fifth volumes of his history, which appeared in 1852. The sixth volume appeared in 1854, the seventh in 1858, the eighth volume followed soon after and the ninth volume was given to the public in 1866. In 1867 Mr. Bancroft was appointed minister from the United States to Germany and held that post at the court of Berlin until 1874. In the latter year the tenth and last volume of his history was published, but an additional section, which first appeared as a separate work, was published in 1882. On returning from Germany in 1875 Mr. Bancroft took up his home in Washington and died here January 17, 1891, in his ninety-first year. Mr. Bancroft’s gardener in Washington was John Brady, and John is still with us, known to every florist in Washington and to thousands of other citizens. Brady had some plant hothouses at his own home, 915 25th street, and a great many rosebushes which he raised here were from cuttings from the Bancroft roses. Bancroft and Brady were good friends as employer and employee, and Mr. Bancroft did his gardener many kindnesses. In the Bancroft garden was one rose which attracted the particular attention of Brady, and he and Mr. Bancroft often conferred about it. The gardener thought he saw in it possibilities, though the bush was not vigorous and despite all effort, its health continued to decline. It was quite well settled in the minds of Mr. Bancroft and his gardener that this particular rose was “La Madame Ferdinande Jamin,” a French rose which had been transplanted to Germany, and for a considerable time was cultivated there. It languished in Germany, and a prominent rose grower in Hamburg gave a bush to Mr. Bancroft, and that particular bush was said to be the last specimen of “La Madame Ferdinande Jamin.” It was set out in the H street garden, but no care could make it a robust plant. Only the eye of an expert on roses could have seen possibilities for development in that rose. Brady took the plant to his own hothouse that he might the better nurse it, and from it he obtained cuttings which grew very well. Mr. Field, during the administration of President Grant, was in charge of the White House greenhouses. When he and his brother set up their establishment off Rawlins Square on the land at the northeast corner of 19th and E streets they specialized in La France roses and did a great deal toward making that a very popular rose in Washington. The greenhouses at the rear of the old brick house on Georgia avenue are devoted to the culture of orchids and there grow the dark magenta cattleya with deep maroon lip, which is the favorite flower of the wife of the President and was such for a long time previous to her marriage. For years she has been buying the blossoms from retail florists and probably even today she does not know where they are grown. Mrs. Wilson’s favorite flower, the orchid cattleya, came from Brazil. Growing back of the old brick house are thousands of the white lelia, an orchid which was brought to the United States from the Pacific coast of Mexico, the orchid vanda – light blue with a border of dark blue around the lip – which was brought from India, and white cattleyas. Washington does not consume all the orchids grown in those greenhouses, and shipments are made to cities as far west as Chicago and St. Louis and as far east as Boston. Some time the Rambler is going to rummage around among those strange and wonderful flowers that grow at the back of the old brick house, but just now he must turn to another subject. During the process of the erection of the Octagon House Gen. Washington often visited the building. He took a lively interest in the house, it being the home of his friend as well as one of the finest residences in the country at that time. After the year 1814, the British having burned the White House, President James Madison occupied the Octagon House, and during his occupancy the treaty of Ghent, which closed our second war between the United States and Great Britain, was signed by him in the circular room, which is now used as the secretary’s office of the American Institute of Architects. But there are other octagon houses in and around Washington. Long ago the Rambler told the story of the Lingan octagon house, off the Foxhall road, west of Georgetown. The Foxhall octagon house, near the Highlands, has long been one of the features of the city. On Georgia avenue, about a square west of the Field place and between Quincy and Randolph streets, is one of the old and interesting octagon houses of Washington. It is on the west side of the street and on land considerably higher than the street. It was built more than seventy years ago by Benjamin Summy, who lived to be over ninety years of age. His descendants are many and a large number of them are living in Washington. A large acreage was appurtenant to the house when the Summys lived there, and Benjamin Summy was a farmer and gardener of ability and means. He built the octagon house of rock and cement and it is in a good state of preservation today. There is a considerable tract of garden land on the south and west of the house even now, but the city is crowding upon the old house from all sides. The property went out of the possession of the Summy family about 1877 and a Mr. Conradus and his family occupied the place for about seven years. 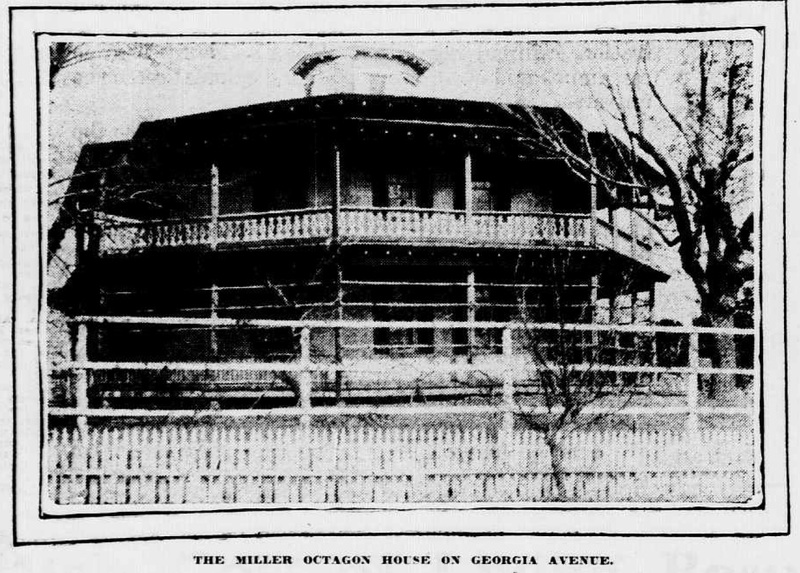 In 1884 the property was bought by William Miller, who lives there today with several members of his family. Mr. Miller was born on Capitol Hill. He married Miss Heine, a daughter of William Heine, who owned and operated a field adjoining the Summy place on the west as a truck farm. 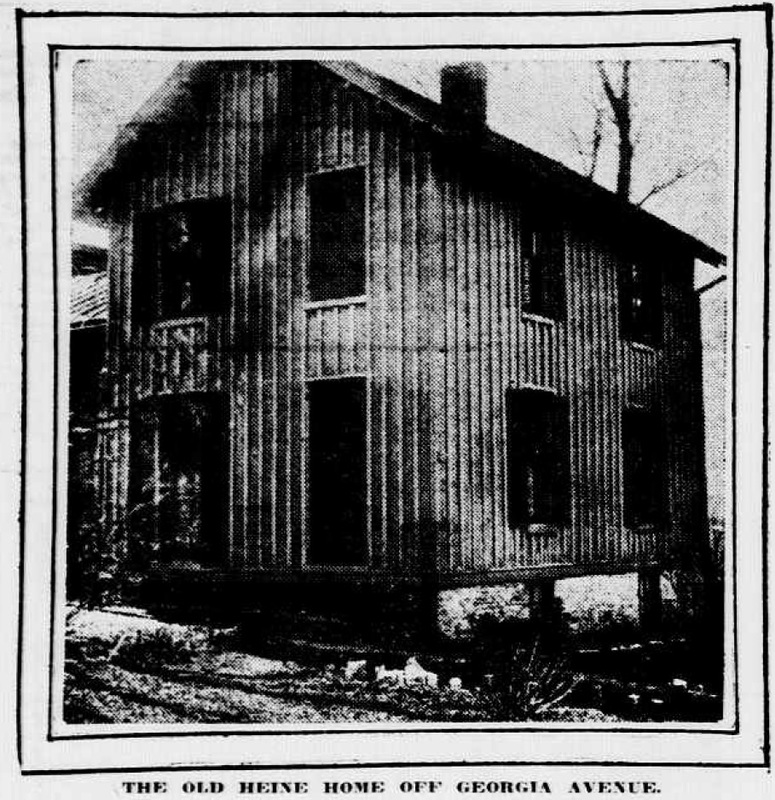 The old Heine house still stands in the midst of new houses on Shepherd street, a few yards west of Georgia avenue. The present owner, Vincent F. Howard, has had the place for five years and has modernized the interior, but has let the exterior remain as in the days of Heine. Mr. Howard is an amateur florist, and the garden at the side and front of his house is one of the summer show places of that part of the city and one of the beautiful flower gardens of Washington. 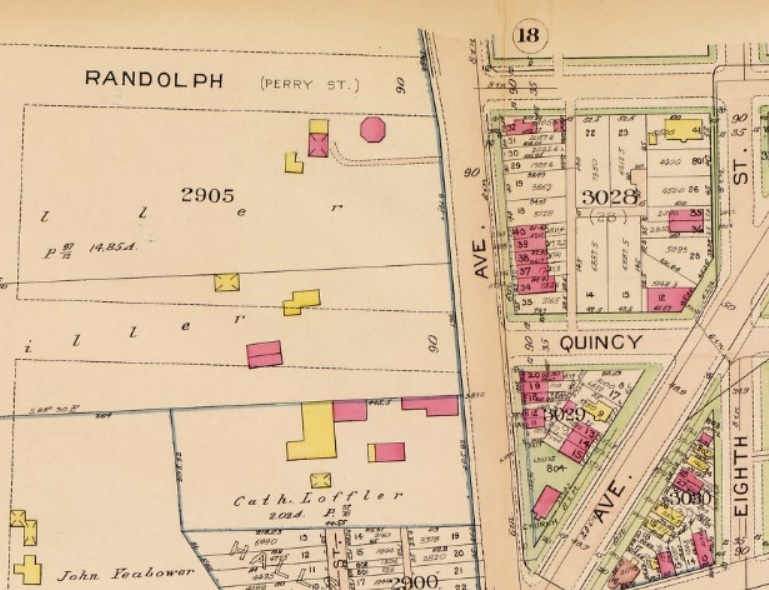 Detail from Baist map showing location of Octagon house, located where the Safeway now stands. The 7th street octagon house has a two-story porch around it, and like so many other old houses it has a cupola. In it are fourteen rooms, and one room which was the Summys’ kitchen has eight doors and two windows. One can lose his bearing in the quaint halls and stairways of this house. The grounds at the front of the house are planted with trees and shrubs, and some of these notably the hemlock trees, were set out by Benjamin Summy when he was a young man. The deep well off the northwest side of the house is still in use, and the Rambler found refreshment there. It is an interesting place to visit, and young Miller, who stands by the wellhouse, entertained the Rambler with good stories about the old house. This entry was posted on November 26, 2014 at 7:01 am and is filed under History. You can subscribe via RSS 2.0 feed to this post's comments. I laughed at the Rambler’s off-topic mini-rant regarding the vulgarity of houses being built close to the curb.